Las Vegas is a giant bicolor that is a tall and vigorous grower. 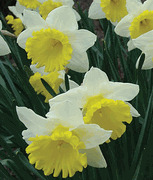 Its frilled, lemon-yellow trumpet has a wide-open mouth and is surrounded by creamy white petals. The size and bright colors of this daffodil make it stand out in the landscape. Sold in lots of 5 bulbs.